The 52 Ancestors in 52 Weeks challenge this week is sports. Sport was never a big thing in my childhood – we didn’t tend to watch it or play it. I grew up riding my bike around the neighbourhood or swimming in a mates pool. Our extracurricular activities revolved around music not sport. Dad, did for a time, play rugby. I grew up in a home that did not revolve around sport on the television or in extracurricular activities. I never questioned this, that was just how it was. 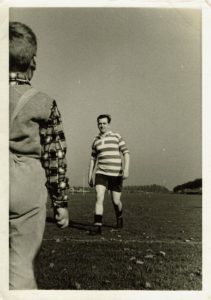 However, one day not long before dad died, I came across a photo of him in sports gear. I do recall him talking about playing rugby when he was younger, however, had never seen the photos. He had to give up playing when he had bilateral retinal detachment, which also saw him give up his trombone for a time – you can read more about this in Music. The two photos I have found are this individual one, which he thought was taken in Oswestry about 1958 when he was doing his National Service. Unfortunately by the time I found this photo he was suffering the effects of dementia. 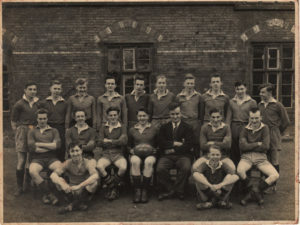 This group photo was of a rugby team he was a part of in 1955-1956 when he was 17 years old so most likely was his school rugby team in Stafford. Lovely mementos of my dad’s past. Do you have any sports fans or athletes in your family? Tell me about them in the comments.